Home » Food Processors & Mixers » Stand Mixers » What is the Best Stand Mixer for Bread Dough? If making bread is your thing, whether for a home business or as a regular domestic activity, then it goes without saying that a machine to do the kneading is what you need. Making bread can take a lot of muscle if you’re doing the kneading by hand and the dough doesn’t always turn out consistently good. This is where a mixer can help. But not just any cheap hand or stand mixer but a heavy duty one. A stand mixer for bread making in particular is better because it is more powerful, as the dough is tougher than cake or cookie dough. But, what is the best stand mixer for bread dough? When getting a stand mixer, you will need to keep a number of factors in mind. Regular bread making will need power of at least 300 watts and it should be heavy enough that it doesn’t rattle about on the counter when facing resistance from the dough. The mixing bowl should be at least 4.5 quarts in capacity as this will ensure that you can mix a good size batch of dough or at least a double batch of cake dough. You need to consider if the stand mixer can start slowly as this will ensure that you don’t get flour all over, or if you will need a splash guard that will keep the flour in the bowl. Also good to know is how the mixer works. Does the head move in a planetary action where the whole work is done without you manually scraping the sides of the bowl? Maybe you need a mixer with dual heads if you’re baking for a large family. Will you need additional attachments other than just the beater, dough hook and whip? Many stand mixers come with optional attachments for jobs like juicing and blending. Here are some really useful attachments that Kitchenaid makes for all their stand mixers. Of course, not all jobs need a stand mixer. If one is not already on the counter and the job is just a short and easy one, consider getting an electric hand mixer as it is easier to use and clean. You could also consider a food processor that comes with dough blades, as these appliances can also chop, dice, slice and shred foods to save you lots of time in the kitchen. If you want one machine to do the kneading, rising and baking with minimal attention from you, choose a bread machine instead. If you’d like a narrowed down list of stand mixers for you to choose from for your dough mixing needs, the ones below are some of the best stand mixers for dough. The heads of tilt head mixers are pushed up and away from the bowl underneath when you’re done mixing. They are great for small families as they’re easy to use and it’s easy to scrape off dough from the mixing paddles or add ingredients in stages. However, they are usually less durable if you use them for large batches. 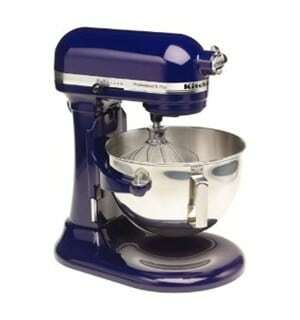 Home cooks love the Kitchenaid Artisan series of stand mixers. The delightful range of more than 20 colors means you can find one to exactly match your kitchen decor! Not only is cake and cookie mixing fun, bread making is easy too, unlike with the Classic series. If that’s not enough, you can spend a bit more and also pick from an optional range of 15 attachments for the multi-purpose hub. They let you do everything, from grinding to pasta making. A stainless steel dishwasher-safe bowl (5 quart) has a handle so you can lift it easily, and the tilt head design that locks into place when you bring it down gives you easy access to the mixture when tilted up. To give you a better idea of its capacity, it can mix dough for around 100 cookies or 4 loaves of bread. The mixer is rated 325 watt and you can choose from 10 speeds. You can add ingredients in the middle of mixing via the pouring shield provided which has a large chute. The mixer comes complete with a nylon coated flat beater, wire whip and a C-shaped dough hook that all move in a planetary action around the bowl to catch every bit of the ingredients from the sides. It measures 14”x8-2/3”x14” with 1 year warranty. Customers say that it operates quietly and quickly but you have to make sure the head is locked into place and the screw going through the hinge is all the way through before you turn it on. Customers also advise that bread dough kneading should be done on the “2” speed and no higher otherwise the gears can burn out. Now, you may wonder if you really need the Artisan if you want a tilt head Kitchenaid mixer or if you can go cheaper with the Classic or Classic Plus. If bread making is a frequent task for you, the answer is yes and you’ll understand why if you read our comparison guide of the Artisan vs. the Classic vs. the Classic Plus. If you think the Kitchenaid above costs too much, consider this option. The Hamilton Beach Eclectrics Stand Mixer provides a professional two way mixing action when it revolves around the bowl, while the flat beat, dough hook or whisk attachment rotates the opposite way. It is powerful at 400 watts and goes up to 12 speeds. The smudge-free coated all-metal mixer has a stainless steel bowl which is 4.5 quarts in size and locks into its base for stability. Its tilt head can quickly be released for easy bowl removal and access to the ingredients. It measures 14 by 8 by 14 inches and comes with a 3-year warranty. At any speed, the machine will ensure constant power due to its high-performance electronics, although it gets a bit noisy once bread dough starts getting stiff. Users say they love that this mixer is heavy and can handle tough bread dough. While you can only get this in one of 4 colors and it doesn’t support additional attachments, it does cost quite a bit less than a Kitchenaid Artisan mixer. The Cuisinart SM-55 Stand Mixer features an amazing 800 watt motor in a metal casing with power to drive the heaviest mixing tasks. It has a large stainless steel bowl (5-1/2 quart) with handles, giving it the ability to accommodate large batches. When it comes to precision, this is the mixer for you. A 15 minute countdown timer and automatic shut off is featured together with 12 mixing speeds. You can select slow start or gentle folds functions, where the former will give you a smooth run free from splatters, and the latter will give you gentle handling of ingredients. Using a planetary action, it has a flat mixing paddle that ensures full mixing to the bottom, a whisk for efficient egg or liquid beating, and a hook for the bread making. With extra wide splash guards, mixing is mess-free. You can process food, grind meat, extrude pasta and juice citrus fruits by using the additional attachments sold separately for this mixer. They can attach to any one of the three power outlets provided on the top front and at the back. Each outlet runs at a different speed so every job is handled efficiently. It measures 15-1/2”x10”x12-1/2” with a 5 year motor warranty and 3 year product warranty. It is available in 3 colors. A few users say that this mixer is a bit noisy and that you may need to stop the mixing periodically to push down the ingredients before continuing as they tend to rise up in the bowl. Instead of tilting the head into the bowl for mixing, the bowl lift mixer has two arms that hold and lift the bowl up. When the job is done, the bowl is set down. If you regularly mix large batches of dough, consider buying this type of mixer. It is not as easy to scrape off dough from the hooks and beaters because they don’t tilt back, but they are more powerful and can withstand the resistance from the dough better. The Kitchenaid Pro 5 is very similar to the Artisan with a few key differences. While the hub cap flips up to allow you to easily fix the attachments, the head does not tilt. Instead, two support pins hold the stainless steel mixing bowl via brackets. A handle on the side of the stand mixer makes it lift the bowl and locks it into place. This design is specifically meant to make heavy dough jobs easier because the mixing head is a solid piece that stays put. It also includes a flat beater, dough hook and whisk, but the hook is spiral shaped instead of C shaped like on the Artisan mixer. The beater rotates clockwise while the shaft revolves counter-clockwise to gather ingredients completely. A soft start feature prevents a puff of flour from getting everywhere and an overload reset prevents overheating of the motor. The rest of this machine is the same as the Artisan. It has a motor with a power rating of 450 watts and a 5 quart polished dishwasher safe bowl made of stainless steel with a lifting handle. It also gives you 10 speeds. It measures 16-1/2 by 12 by 14 inches. This is a good mixer to purchase although some users have complained of the noise it makes. This is one of the most powerful machines when it comes to mixing. It has an 800 watt motor that will enable you to handle the largest batches with the 6.5 quart bowl. The blending ability, the attachments that come with it and the power rating will satisfy all your mixing needs. The Bosch Universal Plus machine is easy to clean and long lasting. It has 4 low speed and high speed settings plus a pulse setting and features an integrated cable storage. With this mixer you won’t need additional kitchen appliances due to the accessories that come with it. You will get a wire whip, splash ring, dough hook, bowl and lid. It uses dual heads to cover the larger area and the design keeps the dough down while being mixed unlike many single shaft mixers where the dough rises up along the shaft as it comes together. Suction cup feet keep the mixer in place even during heavy bread dough mixing. A common complaint is that this machine is not good for making small batches of cake or cookie dough but this can be solved by purchasing the optional cookie paddle. Another is that the bowl is harder to clean because there are several nooks and crannies to reach into. So, there you have it – five great choices for any kind of bread kneading job. I hope this article helps you find the best mixer for bread dough for your family’s needs.